TomTom GO 930T is pre-installed with mapping for Europe, USA and Canada. The TomTom GO 930T provides 4.3-inch colour touch screen, with 2D or 3D moving maps display and includes full 8-digit UK postcode search. The TomTom GO 930T includes a RDS-TMC module, providing real-time traffic information and recalculating the route on request. TomTom GO 930T also includes speech recognition technology enabling you to enter your destination by simply announcing the address. The TomTom GO 930T also provides hands-free calling and traffic information with compatible Bluetooth-enabled mobile phones. TomTom GO 930T has been discontinued. Accessories, spares and parts are still available for your GO 930T. The TomTom GO 930T satellite navigator comes with the latest and most complete maps of Europe, US and Canada pre-installed on 4GB internal memory. The large high-quality 4.3-inch touchscreen and latest version of TomTom's award-winning, user-friendly software enables you to plan your route to fit your requirements, such as: quickest, shortest, avoiding toll roads and congestion charge areas, by required arrival time, etc. For easier input of your destination the TomTom GO 930T provides speech recognition software enabling you to enter your destination by simply announcing the address, with no need to touch the screen. Speaking the address, to tell your GO 930T where to take you, is much easier than typing. You can also answer while driving, so you can keep your eyes on the road with combination of text-to-speech and speech recognition technology. For example: The TomTom GO 930T asks: "A new text message was received; shall I read it aloud?" and you just reply "Yes" or "No". The TomTom GO 930T provides subscription free real-time traffic information via the RDS-TMC Traffic Receiver and then displays the various events and give you options on how to avoid traffic congestion in the road ahead. Hands-free calling, via Bluetooth lets you take a call with just a tap of the screen, or with speech recognition just saying saying "yes". So you can keep your hands on the wheel and eyes on the road. With optimised acoustic design, enhanced noise reduction, echo cancellation technology and the new high performance speaker the TomTom GO 930T gives you the best hands-free calling experience, comparable with Bluetooth hands free car kits. The TomTom GO 930T also provides you with access to literally thousands on Points of Interest (POI) - petrol stations, parking, restaurants, cash machines and lots more. Many now come ready Rich Content - extra information on your destination or stop, such as overview maps, pictures, description and phone numbers. The TomTom GO 930T has been designed to be a portable plug and play device, and as such can be transferred from vehicle to vehicle with ease by the user. The GO 930T is powered with a 12-volt adaptor cable in-car (supplied) and attaches to your vehicles windscreen via the windscreen mount which is also included. TomTom GO 930 comes with the latest and most complete maps of Europe, US and Canada pre-installed on 4GB internal memory. Which in addition to street information include features such as route calculation, Points of Interest, Estimated Time of Arrival, and TomTom Map Share technology. TomTom’s unique Map Share technology enhances your navigation experience, because you can now make instant changes directly on your map. TomTom Map Share technology allows you to make corrections to your own map and benefit from thousands of corrections made by TomTom users every day - free of charge. Detailed coverage in Western Europe: Andorra, Austria, Belgium, Denmark,Finland, France, Germany, Great Britain, Italy, Liechtenstein, Luxembourg, Monaco, Norway, Portugal, Republic of Ireland, San Marino, Spain (including Canary Islands), Sweden, Switzerland, The Netherlands, and Vatican City. Detailed coverage in Eastern Europe: Croatia, Czech Republic, Estonia, Hungary, Latvia, Lithuania, Poland, Slovakia, Slovenia and the Russia Federation. Road Connector coverage in Eastern Europe: Coverage of major roads to allow guided navigation from city to city and around the borders of neighbouring counties: Albania, Belarus, Bosnia-Herzegovina, Bulgaria, Macedonia, Moldova, Montenegro, Romania, Serbia and Ukraine. Maps of North America: This latest map is the most complete and accurate map ever released of the USA and Canada. It also contains a separate map of Guam. Looking for genuine accessories and spares for the TomTom GO 930T? 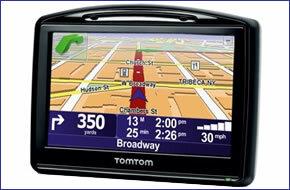 All parts are genuine TomTom product and specifically designed for use with the GO 930T sat nav. Accessories available to purchase include a suction cup mount, mains AC charger, beanbag dashboard mount and iPod connection cable. Do you have a question about the TomTom GO 930T? Submit your question via our contact page.